Mamy remains the only Korean restaurant I’ve ever eaten in. It’s always our default option when we have visitors in town, as it’s one of the few Prague eateries I know with both meaty and vegan dishes on the menu. I don’t know much about Korean food, but I’ve always sort of assumed I wouldn’t like it. Just about every ESL teacher ends up in South Korea at some point, but the food was one factor that discouraged me from seriously considering it – not only the lack of meat-free options, but also the spiciness. Fortunately, I’ve found a few mild dishes on the Mamy menu that keep me going back for more. 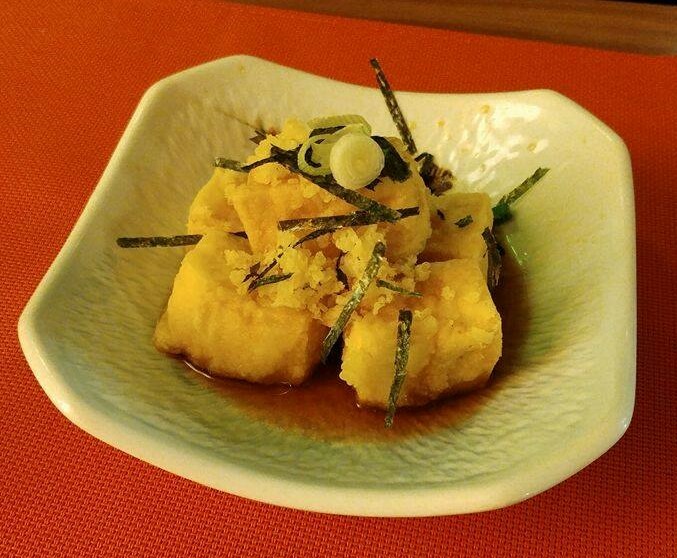 It is always a good idea to order this fried tofu dish to start. 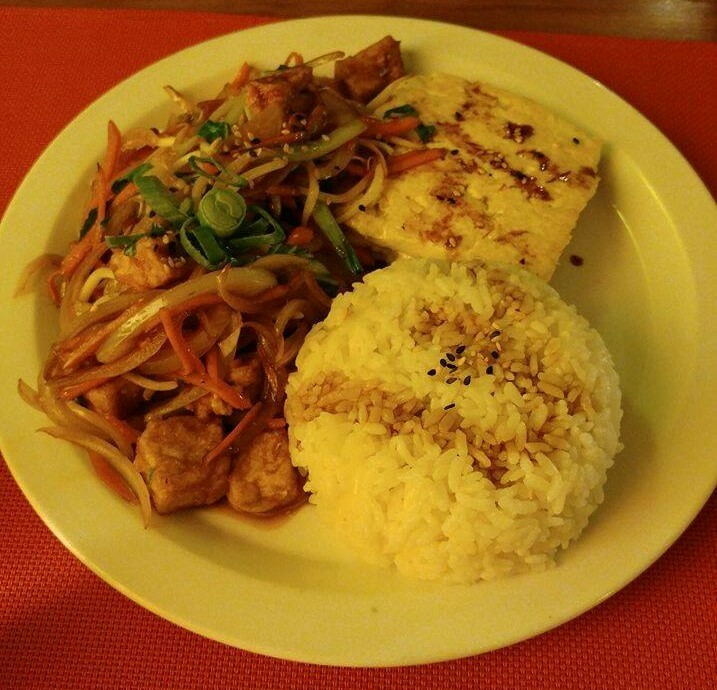 Fried tofu is always a winner in my eyes, and when you factor in a tasty sauce, I’m sold! The vegetable kimbab is also always a good option – yes, largely because it’s not remotely spicy. I always forget how filling things like this are. It looks like just a few mouthfuls, but before you know it you’ve eaten a whole sack of rice! These are always fresh and delicious. 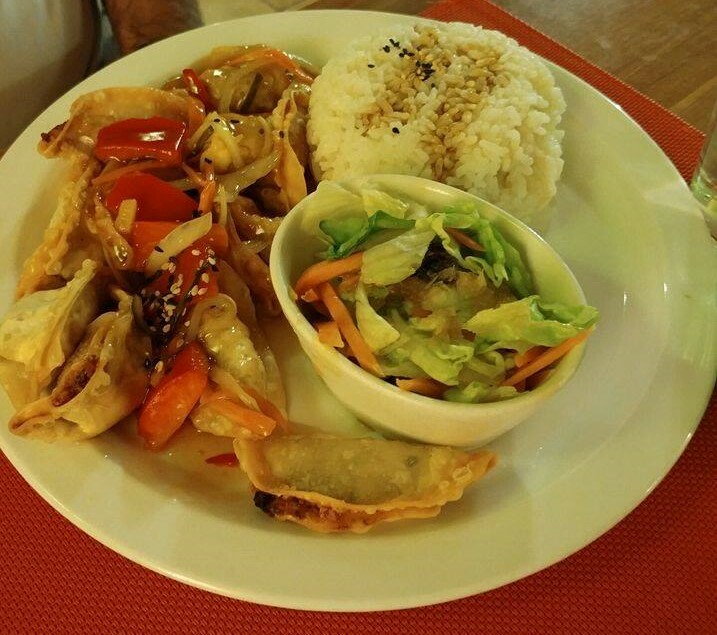 Dr HH will order anything with dumplings on the side, and rightly so – they are crispy and delicious. He enjoyed this mandu tangsu, with is fried dumplings and vegetables with sweet and sour sauce. This was obviously not as overwhelmingly spicy as the dishes we ordered on our first visit, so he managed to devour the lot. 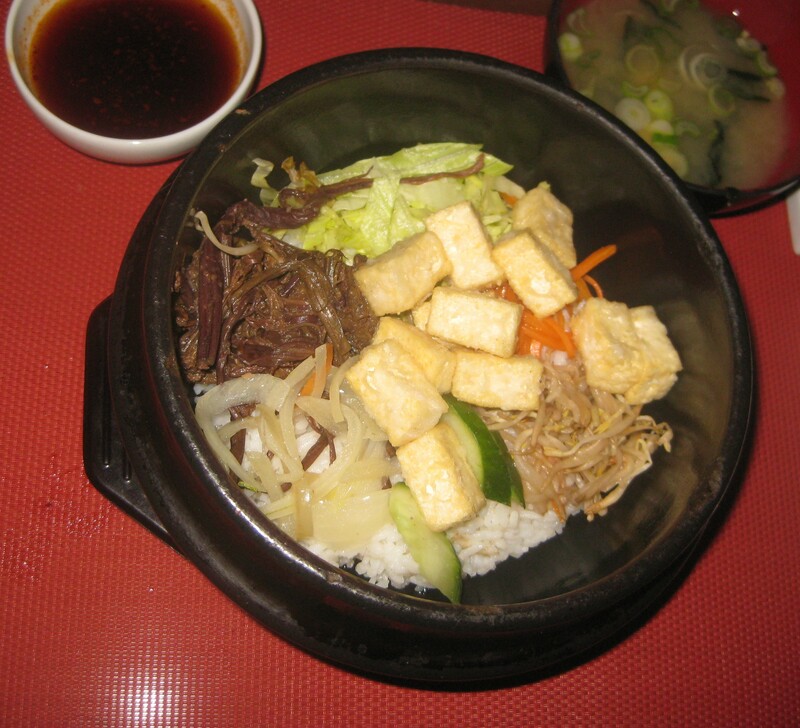 We also enjoyed this tofu bibimbab, a big bowl with fried tofu, carrots, onions, salad, soy sauce, and rice, with a little dish of soup on the side. This is a hearty dish, but perhaps not quite as exciting flavour-wise as some of the other things we’ve ordered. I had high hopes for this teriyaki tofu dish, but it was actually disappointingly bland – the tofu hadn’t really absorbed the teriyaki sauce as I’d hoped. Even as a great defender of tofu, I can’t endorse this dish. But they do definitely know how to cook tofu (again, I refer you to the fried tofu starter), so don’t be discouraged from ordering something tofu based if you visit. Will I ever branch out to another Korean restaurant?! Who knows! 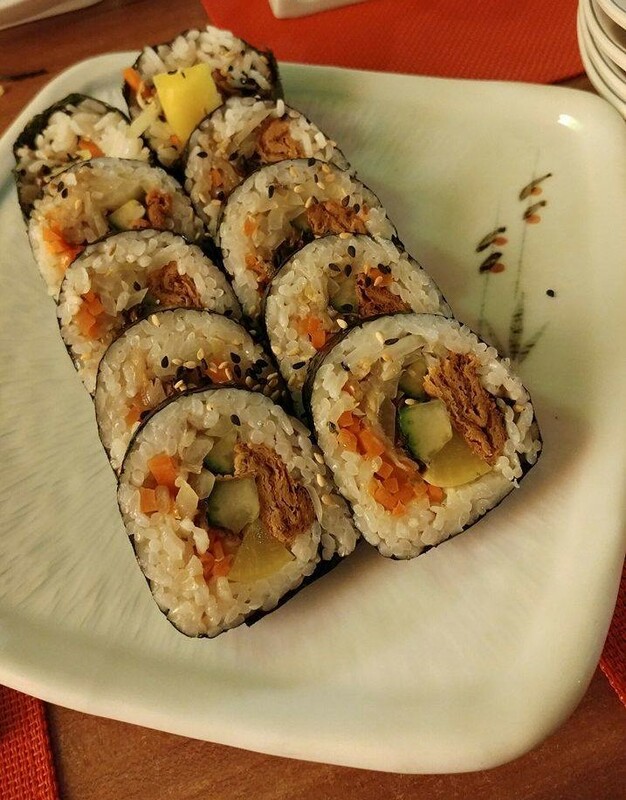 This entry was posted in Travel, Vegan Mofo and tagged Mamy Prague vegan, vegan Prague, vegan travel, veganmofo18. Bookmark the permalink. Sounds lovely. I haven’t tried very much Korean food. I follow a Canadian vegan youtuber who lives in Korea so it’s interesting to see what she eats. In London there’s a Korean Italian fusion restaurant called Vegan Yes that has some interesting dishes, I’ve had a dish which is a mixture of gnocchi and Korean rice dumplings which was gorgeous! If you go to a Korean place again I suggest trying to order a vegan Japchae. It is a stir-fry dish that uses a sweet potato glass noodle. I love it, but never order it because I am a weirdo. It is very yummy and NEVER SPICY! I also recommend getting Jajangmyeon, if you can find it vegan. It is a yummy noodle dish that is covered in a salty black bean sauce. Haha, that’s interesting about the sociable approach to eating. I’ve made a note of those two dishes for future reference! I haven’t had much Korean food, but this is making me want to go out and try new things. Everything looks super tasty. It was a little daunting the first time we went, as they have quite a lot of vegan options but we had no idea about Korean food at all! We almost know what we’re doing now!